Athens, Ga. – The University of Georgia Center for Undergraduate Research Opportunities recognized 16 graduating high school seniors as 2012 Promising Scholars and invited them to experience first-hand the opportunities that UGA students have to engage in research as undergraduates. 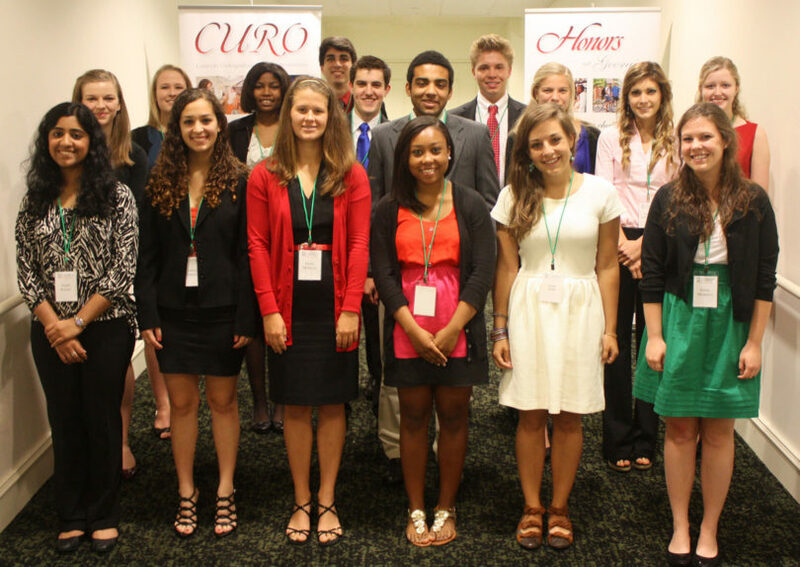 During a two-day visit to campus, the Promising Scholars got to attend the CURO Symposium, where more than 190 undergraduates presented their research projects produced under the guidance of faculty mentors. The Promising Scholars also attended a roundtable discussion facilitated by current UGA freshman and sophomore participants in CURO’s Honors Scholars program. The undergraduates’ faculty mentors were available to respond to questions about the research process and their individual disciplines. Learning about the available possibilities for hands-on inquiry at the undergraduate level was a highlight for Promising Scholar Noah Boswell, a senior at Whitefield Academy in Mableton. Promising Scholars Melissa Jennings of Buford and Anjali Kumar of Lawrenceville commented on the benefits of interacting with current students conducting research. They are both seniors at the Gwinnett School of Mathematics, Science and Technology. The Promising Scholars also participated in campus tours led by CURO Honors Scholars such as Cameron Zahedi, a sophomore pursuing bachelor’s degrees in economics, mathematics and physics. Part of the tour included visiting Moore College, the headquarters for the Center for Undergraduate Research Opportunities as well as the venue for the Monday night class the CURO Honors Scholars attend about research expectations and processes. “I think it is a great opportunity for high school students to gain insight into professional research in a college environment,” said Zahedi, who is from Milton. Note to editors: An image of the 2012 Promising Scholars is available for download at http://multimedia.uga.edu/media/images/2012_Promising_Scholars.jpg. Caption: 2012 Promising Scholars are: Row 1 – Anjali Kumar, Lindsay Dahora, Emily McIntyre, Taylor Chishom, Carlisle Kramer, Emily Meadows Row 2 – Elizabeth Wilkins, Caitlyn Van Heest, Melissa Jennings, Zachary Zahedi, Anthony Reyna, Noah Boswell, Marco Roca, Mary Nuttall, Emily Vermillion, Megan Chesne.